The Collingwood Collection is the family archive of an extraordinary family. The Collingwoods have been described as ‘probably the most intellectually and artistically gifted family in the Lake District in the late 19th and early 20th centuries.’ The collection in Cardiff centres around W. G. Collingwood and his descendants. W. G. Collingwood (1854-1932) was an artist, author, professor of fine arts, Norse scholar, and John Ruskin’s friend and secretary. In 1883 he married Edith Mary (Dorrie) Isaac (1857-1928). Often confined to a footnote along the lines of ‘also an artist’, she was, in fact quite remarkable. While she was alive her art was commercially successful – much more so, it seems, than her husband as she was reportedly the main breadwinner in the marriage and exhibited widely both in the Lake District and in London. She was a noted miniaturist and while this is obvious from her artwork in the collection, it is also evident from the many sketches included in her letters to family and friends, such as these two sketches of her daughter Barbara. Sketch of Barbara in a letter from Edith Mary (Dorrie) Collingwood to Ruth Collingwood (her sister-in-law), 1890. She reused this paper which she had sketched on years earlier. Sketch of Barbara dressed up to pay calls in a letter from Edith Mary (Dorrie) Collingwood, 20 July 1889. They had four children. Their eldest, Dora (1886-1964), was another successful artist and married the notable medical doctor Ernest Altounyan. After the First World War, she moved with her husband to Syria where Ernest’s father ran a pioneering hospital in Aleppo. 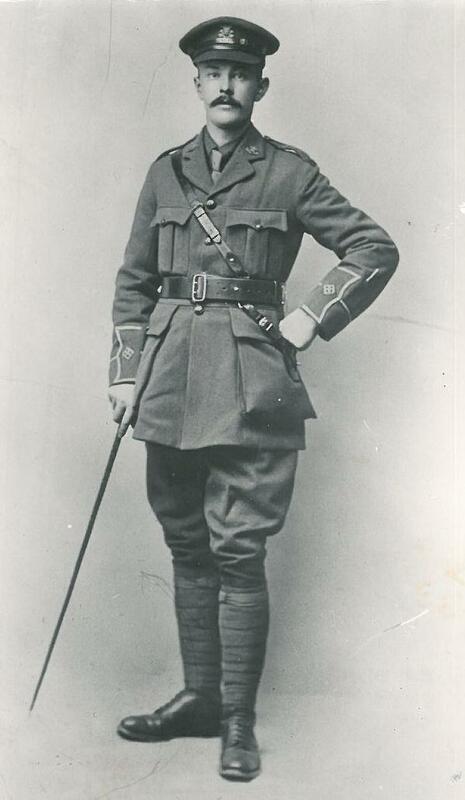 Ernest worked as a medical doctor in the hospital and they were both heavily involved with helping refugees in Aleppo, particularly in response to the Armenian Genocide (1915-23). Arthur Ransome, a close friend of the family, based the Walker children in Swallows and Amazons (1930) on Dora and Ernest’s children. Barbara (1887-1961), the Collingwood’s second child, was a sculptor. Her husband, Oscar Gnosspelius was a civil engineer who specialised in mining and railway construction in South Africa before the war and later prospected on the Coniston Fells with W. G. Collingwood. He was also a pioneering aviation expert and built hydroplanes on Lake Windermere. Their daughter, Janet (1926-2010), was an architect and historian. She was the former owner of the collection before it was deposited at Cardiff University. The Collingwood’s third child, Robin (1889-1943) is better known as R. G. Collingwood and was an influential philosopher and historian. He was among the leading names in British Idealism and an expert in the archaeology of Roman Britain. The Collingwood and British Idealism Centre is based at Cardiff University and aims to ‘promot[e] and encourag[e] research into the life and philosophy of R. G. Collingwood’. Their fourth child, Ursula (1891-1964), was both an artist and a trained mid-wife. She worked as a midwife in London’s East End from around 1912 to 1925 before returning to teach art at Blackwell School and later becoming a farmer. I’ll be writing further blog posts introducing you to some of these fascinating family members over the next few months. During the first few weeks, I concentrated on the boxes set aside as being of particular research interest. These included correspondence between members of the family and notable people such as John Ruskin, Arthur Ransome, E. M. Forster, and even a letter from Beatrix Potter, and many more gems besides. One letter particularly which stood out to me at the time was a letter from E. M. Forster to Barbara Collingwood. Writing in 1916, he describes the effect he believes the First World War was having on him artistically and personally. Much is known of Forster’s pacifism but I have been unable to find an insight as personal the one revealed in this letter. Letter from E. M. Forster to Barbara Collingwood, 9 September 1916. I don’t know… — as this war drags on to its dreary and arithmetical conclusion if to any conclusion at all, the passion in me for all that old High-life and High-art business of which I used to be rather ashamed, seems to increase and express itself less fearlessly. Reading and cataloguing the personal correspondence of the Collingwood family is a real privilege and feeling like I am really getting to know them. It is almost like a novel unfolding with stories not yet told. I felt this particularly when I was reading the letters Edith (Dorrie) wrote to her future husband, W. G. Collingwood, when they were courting. It is not often that one gets such a personal insight into the private lives of others, especially not those from 120 years ago. A few letters have been reproduced hear but I look forward to telling the story of their courtship in a later blog post. Letter from Edith Mary (Dorrie) Isaac to W. G. Collingwood, 18 May 1880. Letterfrom Edith Mary (Dorrie) Isaac to W. G. Collingwood, 20 July 1880, including petals. Postcards with messages written in Runes, sent from Edith Mary (Dorrie) Isaac to W. G. Collingwood, 1883. There is estimated to be around 4000 letters in total in the collection. I have now created item level descriptions of around 30% these. It’s been exciting uncovering stories about these fascinating people, and I’m looking forward to sharing some of these with you over the coming months. 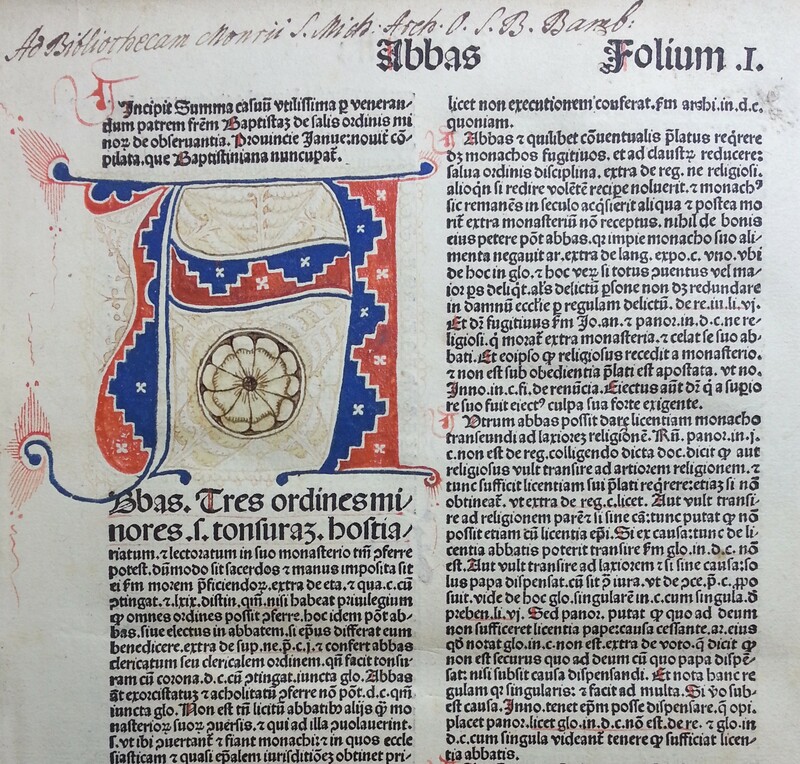 On this blog, we spend a lot of time talking about editions—first editions, modern fine press editions—but what do we really mean by an edition, and why is it important? Bibliographically speaking, an edition is all the copies of a book printed from substantially the same setting of type. It reflects a financial decision on the part of the publisher, influenced by social factors, and manifested in typographical differences between editions. By using these typographical differences to sort books into editions, we can make educated guesses about the social and economic factors that led to their production. For example, if a book was printed in a large format with wide margins and plenty of illustrations, it was probably an upmarket edition, whereas the same text printed in pocket size would have been aimed at less wealthy customers. If a book went through multiple editions, it must have been popular enough to justify investing in another print run. We can trace minor editorial changes in the text over time, signalling the influence of the author, the censor, or the tastes of the reading public (or possibly all three). If an edition survives in hundreds of copies, we might guess that its publishers were confident enough in its success to produce a very large print run, whereas a niche publication may only survive in a single exemplar or as a reference in another text. Cardiff University’s LibrarySearch collapses multiple editions into a single search result, so it’s worth clicking through to see everything we hold. 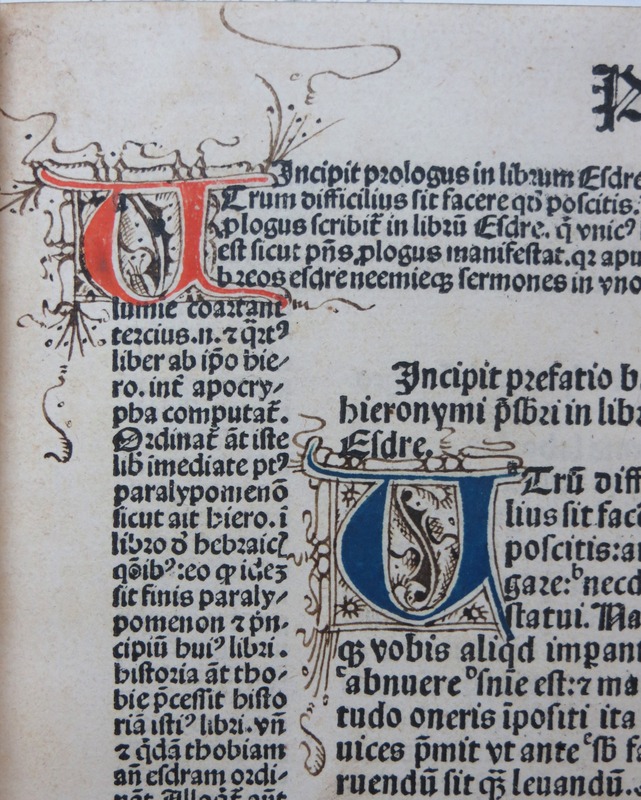 Many researchers who come to special collections do so because they are looking for a specific edition of a text. Most of the time, the difference between editions is obvious, like a different date or the phrase “A new edition” on the title page. Other times, it can be almost impossible to distinguish between two editions without comparing them side by side. One of ways that rare book cataloguers tease apart similar editions is by consulting published bibliographies, and citing a unique identifier for the edition in our catalogue records. 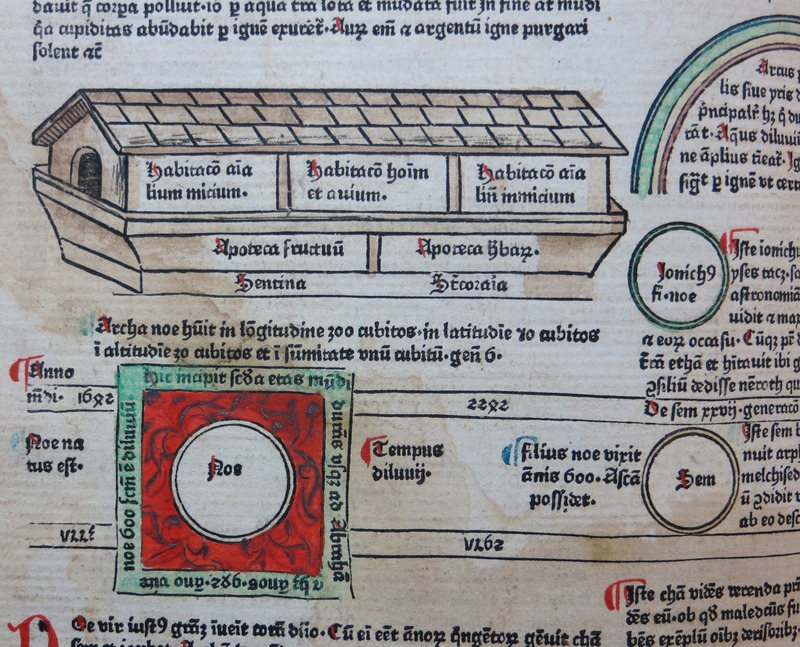 At Cardiff University, we’ve been concentrating on cataloguing our early British books, so the resource that we use most often is the English Short Title Catalogue, or as it’s commonly called, the ESTC. If you’re not already familiar with it, the ESTC is a database which seeks to record every book, pamphlet, serial, and broadside printed before 1801, either in the British Isles, Colonial America, United States of America, Canada, or territories governed by England or Britain before 1801; or wholly or partly in English or other British vernaculars; or with false imprints claiming publication in Britain or its territories. Each record includes a list of libraries that own a physical copy of the item, as well as links to digitised copies in Google Books, Early English Books Online (EEBO), and Eigtheenth Century Collections Online (ECCO). It currently has records for more than 480,000 separate editions held by more than 2000 libraries worldwide, but it’s still far from complete. Many works have been lost through the centuries, possibly because they are relevant only for a limited period of time (like almanacs and news bulletins), because they were used and re-used until they fell apart (like textbooks), or because they were produced in such small print runs that none of them have survived (that we know of). As libraries continue the never-ending struggle to catalogue their backlogs, however, “new” editions resurface. 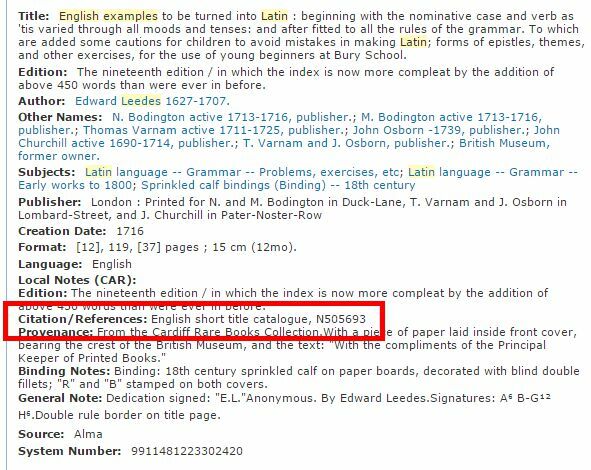 In 2016, Cardiff University cataloguers submitted 27 new records to the ESTC—not bad, considering that these books have avoided detection for at least two centuries! This doesn’t necessarily mean that we’re rediscovering long-lost plays by Shakespeare or scientific treatises by Isaac Newton. For the most part, we’re filling in gaps in the publication history of known works. Many of the records that we contribute to the ESTC are for books that we were reasonably sure must have existed, but hadn’t ever been catalogued before. For example, if the ESTC has records for the first, fifth, and seventh edition of a particular work, it’s relatively safe to assume that the second, third, fourth, and sixth editions must exist somewhere. Sometimes, what we discover is a slight variation of another edition. (That said, new first editions of well-known works do sometimes crop up). Our 1664 edition of Homeri Ilias (left) and another version published by Joannes Field the same year (ESTC R27415). 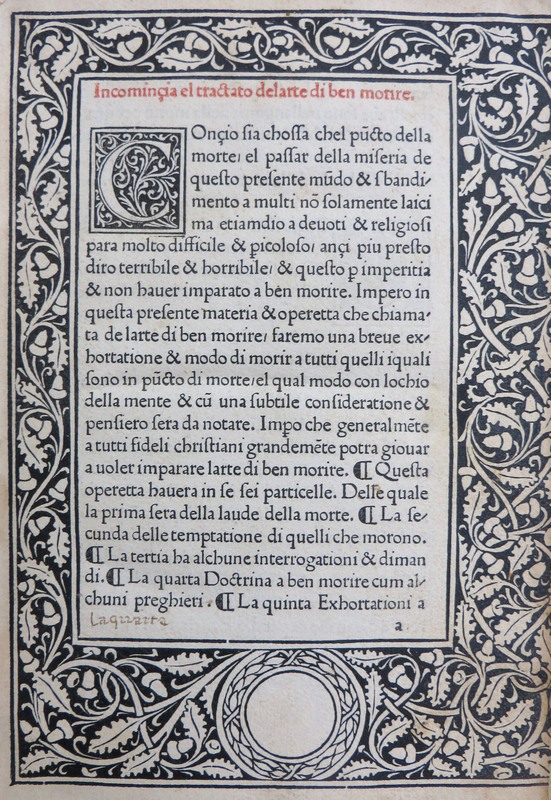 The ESTC had previously recorded a 1664 edition of Ομηρου Ιλιαδοσ: Homeri Ilias published in Cambridge by Joannes Field, calling itself “editio postrema” (latest edition). Our copy, however, omits the Greek version of the title and calls itself “editio novissima” (newest edition). Once you look past the title page, however, the two editions are awfully similar. In fact, they’re identical. Both versions have dozens of pages numbered incorrectly in exactly the same way, suggesting that Mr. Field simply sold the same printed sheets with two different title pages. Our copy says it was sold by J. Robinson, but other versions of this edition have Richard Wilkin and J. Wyat’s names on their title pages. Three slightly different versions of this edition of A discourse concerning the authority, stile, and perfection of the books of the Old and New Testament were published simultaneously in 1693. Two versions, bearing the names of Richard Wilkin and J. Wyat, were already recorded in the ESTC, but our version, with “J. Robinson” in the imprint had never been documented before.Each of these variants has a different name in the imprint, showing the business relationship between three different booksellers around London. Two versions, bearing the names of Richard Wilkin and J. Wyat, were already recorded in the ESTC, but our version, with “J. Robinson”, adds another name to the partnership. Even though J. Robinson’s name appears on the title page, the last page of the book advertises “books sold by Richard Wilkin”. Whenever we find an edition that hasn’t yet been documented, we share our catalogue records with the ESTC and Worldcat so that researchers and cataloguers around the world can find it. Regardless of what the book is, it’s always exciting to be able to add another piece to the jigsaw puzzle of book history. This guest post comes from Fiona McLellan, who spent two months volunteering with us this Spring. 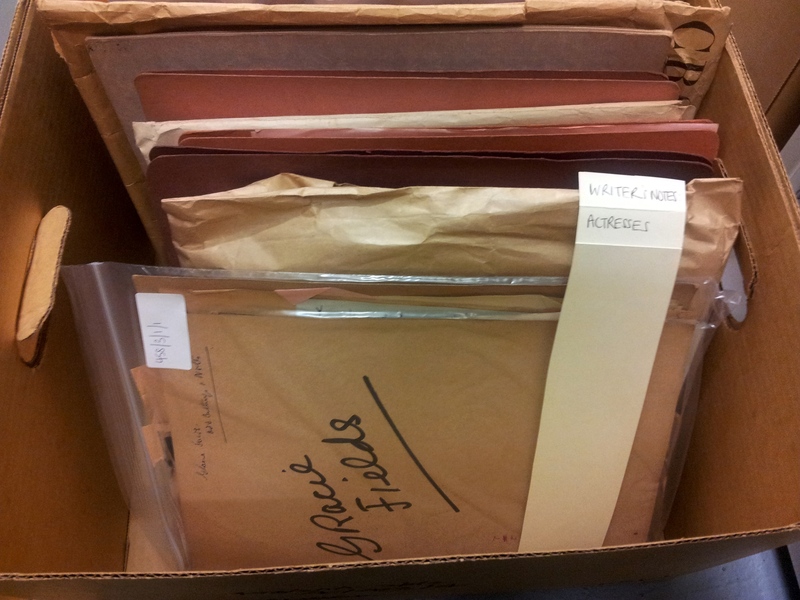 Fluent in German, Fiona catalogued the German-language correspondence contained in the archive of Benjamin Morse. Over 120 letters are now accessible to researchers for the first time, with the online catalogue providing highly detailed summaries of both content and context. “Held at SCOLAR is the archive of Benjamin Morse (1899-1977). 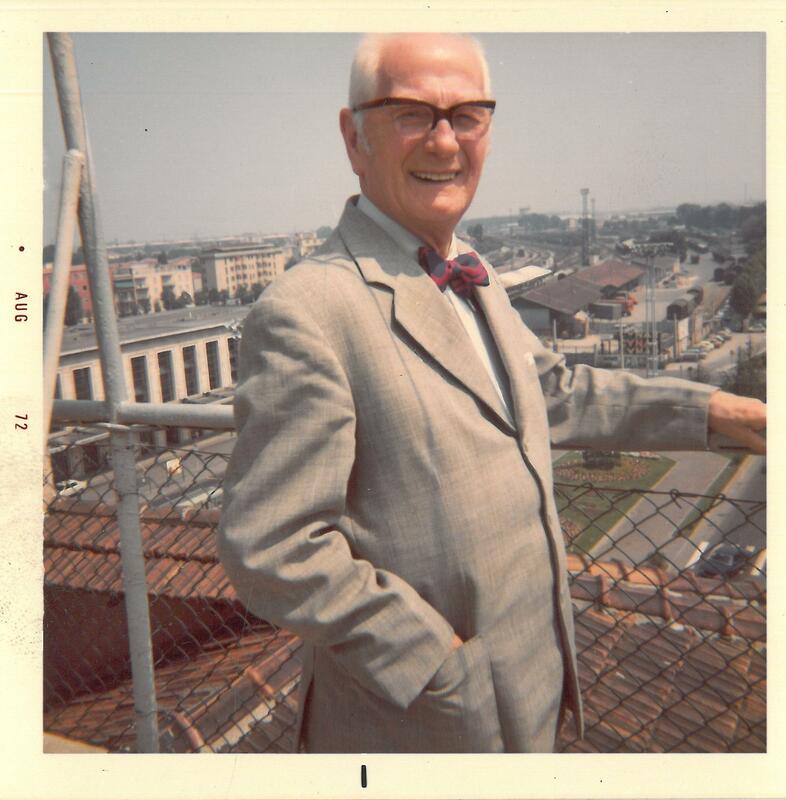 Professor Morse was the lecturer in education, then Italian at University College, Cardiff, where he was employed from the 1930s through to his retirement in 1966. After his graduation from the University of Aberystwyth in 1923, he spent a number of years in Europe, living in both Osnabrück and Trieste. Some of the connections he made while on his travels lasted for decades, and this is attested by his great hoard of letters written in Welsh, English, German and Italian. Having contacted Alison Harvey concerning volunteering opportunities, I was pleased to be offered the chance to catalogue the letters Morse received in German. This I have now done, with the result that their authors, dates and summaries can be accessed online via ArchiveSearch, alongside Alessandra Toschi’s earlier work on Morse’s Italian papers. Although among some 126 catalogued items, only one was written by Morse himself, a partial view of his life and character can be made out from the remarks of his friends and professional contacts in their letters to him. ‘Very Honoured Morse’, or ‘Herr Prof. Dr. Morse’, or ‘Jeeb’ was an exemplary networker. In his lifetime, networking was a word for communications engineers; it had yet to have its social meaning consecrated by LinkedIn; but with his numerous dispatches from his summer holidays, on top of his seasonal messages during the Christmas and Easter vacations, Morse may have single-handedly kept the Italian postcard industry in the black. However, Morse did not confine himself to postcards. Several of the letters he received from Germany in the late 1940s are partly taken up with thanks for the care packages Morse had sent to the family of Rilke and to fellow academics. To my mind, it is a sure indication of the difficult conditions of life in post-war Germany that Morse’s gift of three packs of Ovaltine to Professor Mertner of the University of Münster could be met with such apparently sincere gratitude. But Morse’s papers touch on many subjects, and have allowed me a glimpse into the day-to-day preoccupations of Morse’s far-flung circle: a student from Osnabrück wonders if he has a future as a published German translator of T. S. Eliot; a plagiarism scandal is hushed up at Münster; a retired book seller complains that his children don’t love him any more since he doesn’t have any money. Not only the words, but also the material and physical details of the letters were informative. Those sent in the 1940s were written on sub-toilet-tissue quality paper almost as transparent as a window. 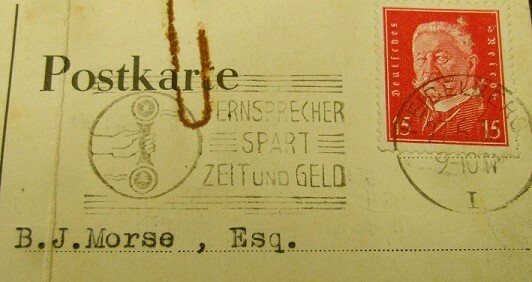 Of additional interest were the social histories contained in the Freistempel or postmarks: the example given here cautions pen-and-paper enthusiasts that ‘the telephone saves time and money’. ‘Owing to work commitments, and my own indecision, I only emailed SCOLAR about a month in advance of the particular 4-week period I was available to work. I was pleasantly surprised when Alison emailed me back with details of a project she would like some help on, and suggested meeting to discuss it further. It was really useful to know the details of what I would be doing in advance, as I could see how relevant to the course it would be, and also I felt more prepared for my first day. The project’s aim was to bring together all of the information about past students and put it into one resource. 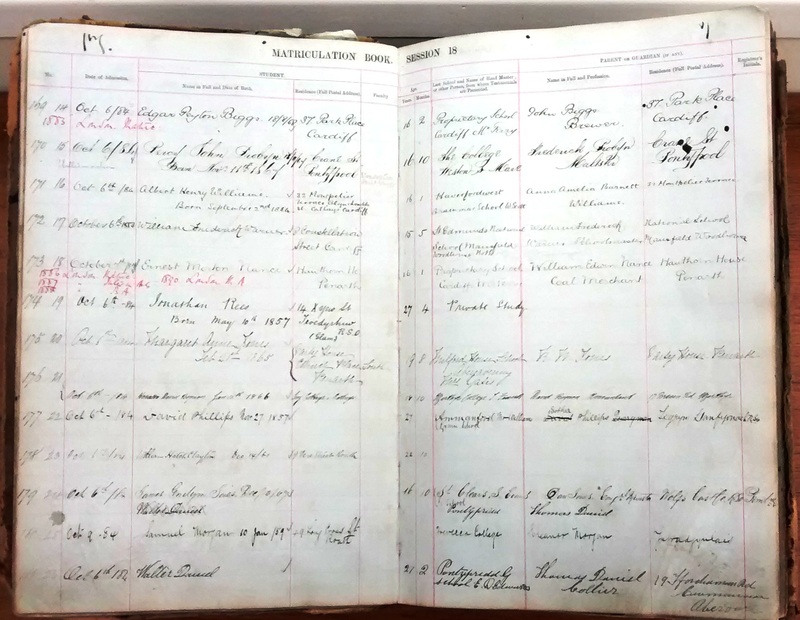 My first job was to transcribe records from the University’s matriculation book, working with an initial five year sample. These records also contained the name, address and occupation of the student’s parents, which was particularly interesting to see. This was my first experience of transcribing, and being involved with making a secondary resource gave me a good insight into the problems that can occur with them. I saw how easy it was to read one word as another, or to not be able to read some things at all. Alison advised me to use the internet, for example Google maps, to double check that what I was transcribing made sense. In particular, the rural, Welsh place names could be difficult. 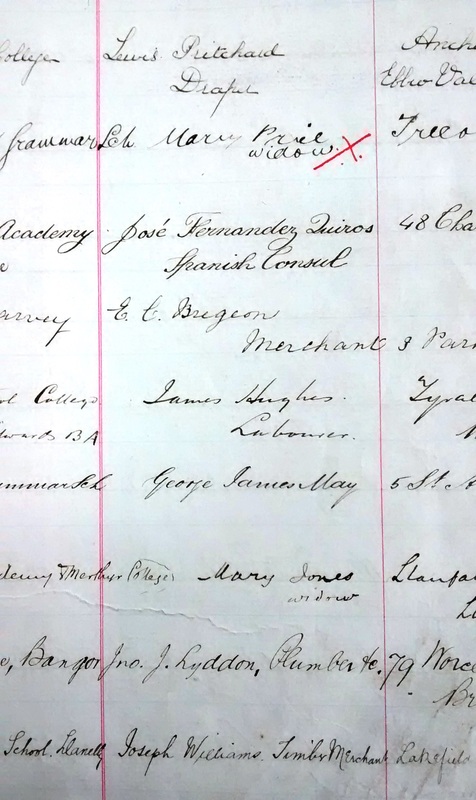 Once these records had been transcribed, I then added the student number, which had been assigned at matriculation, to other data such as examination results, graduation, attendance. All of these documents were then imported into one spreadsheet. It is now possible to easily bring up all of the data about a particular student. Of particular interest is the data on parents’ addresses and occupations, in terms of what it tells us about the geographic spread of students and their socio-economic backgrounds. I really valued being able to be part of one project from start to finish, rather than doing small parts of a project and never getting the satisfaction of seeing it complete. I also appreciated the freedom I was given at this placement. I felt involved right from the beginning, and although Alison was always around if I needed her help, it was good to be given space to make my own choices. 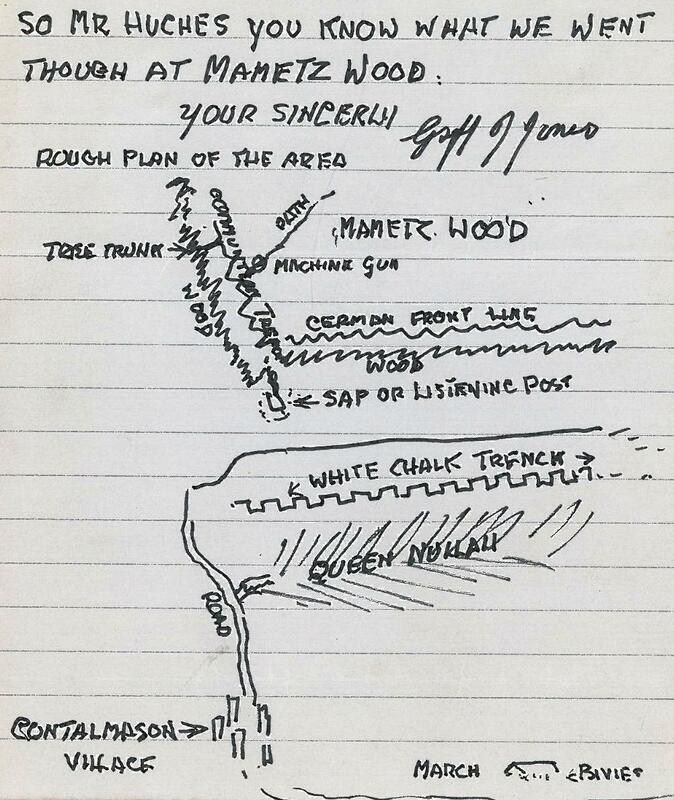 I have recently finished cataloguing a fascinating collection of letters from World War One soldiers who fought at the Battle of Mametz Wood. 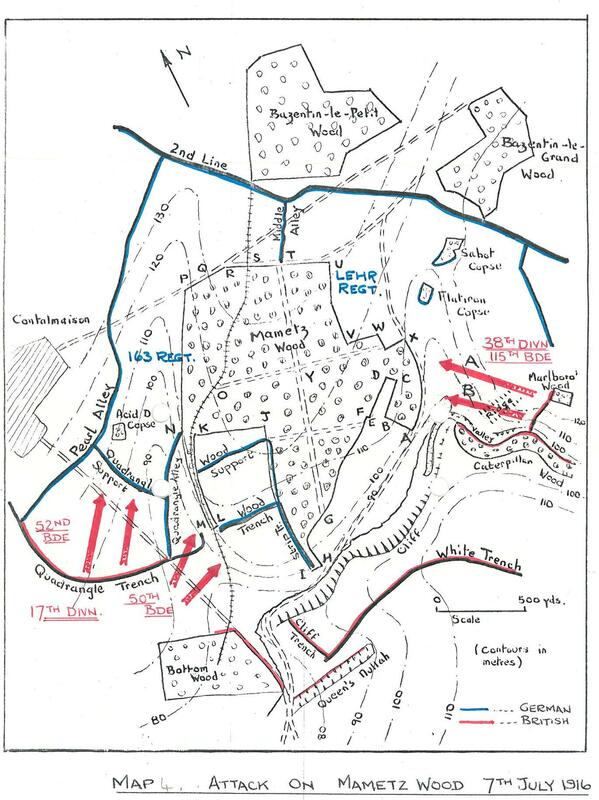 An opening move of the Somme offensive, the battle was notorious for its heavy losses. A five day fight for a square mile of land. Over 4,000 members of the 38th (Welsh) Division were killed or wounded in the battle. 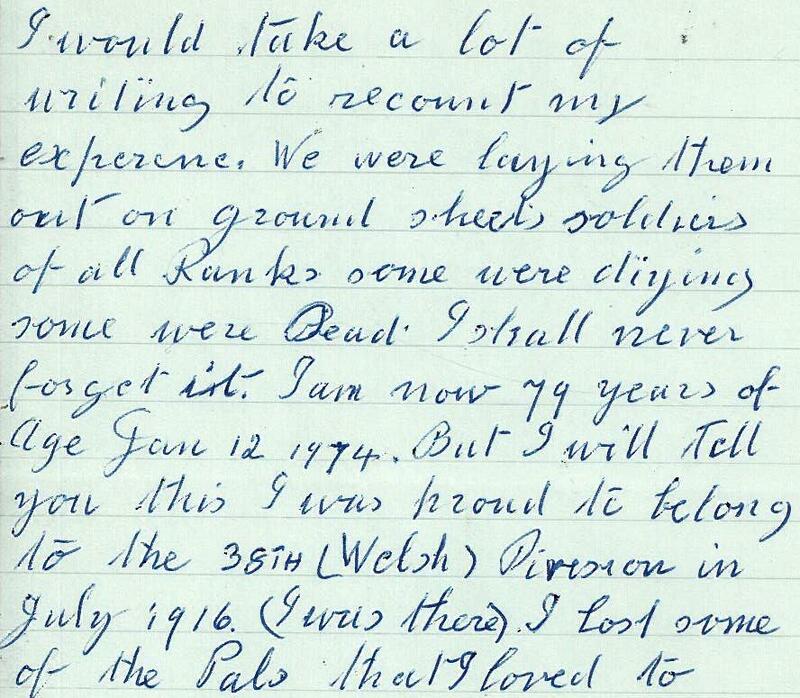 This collection of letters from Welshmen who fought at Mametz was recently donated to Special Collections and Archives via the School of History, Archaeology and Religion. The letters were written in 1974, in response to a notice placed in local newspapers across Wales by the author Colin Hughes. The little advert implored any survivors of the battle to contact him with their memories, to assist with his research. 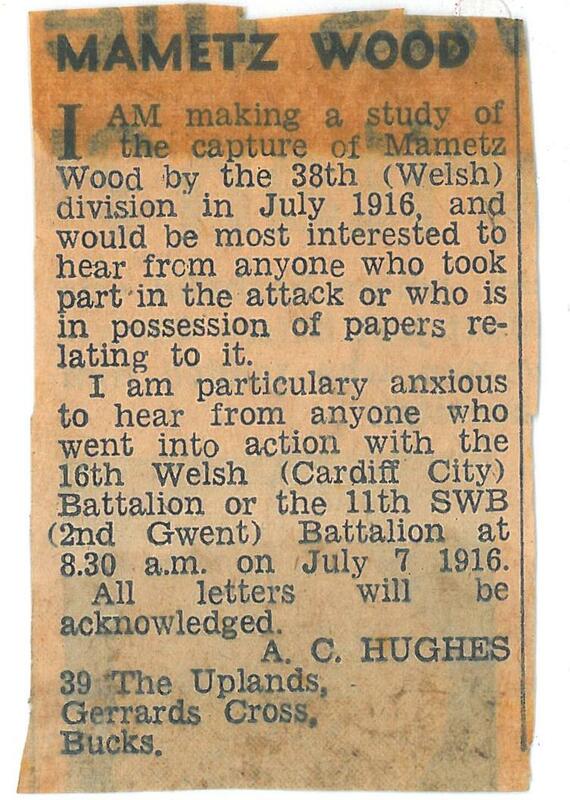 Hughes was inundated with responses from across Wales, from privates, gunners, stretcher bearers, sergeant majors, lance corporals and captains. Their letters tell their personal stories of those five days, in their own words. They also enclose diary entries, annotated maps, and photographs. 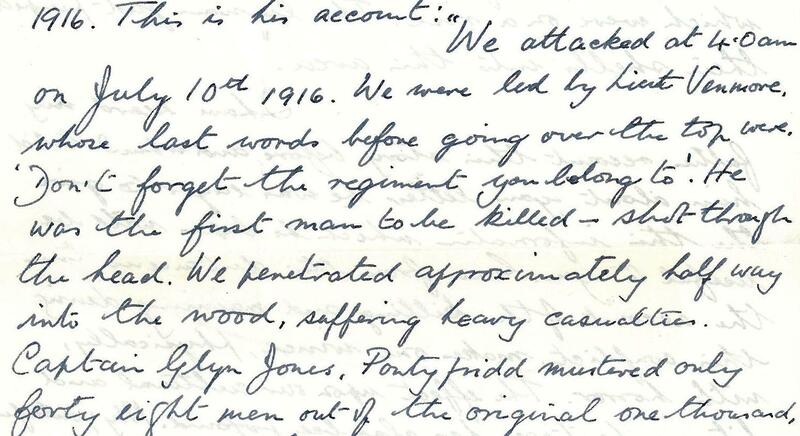 Hughes’ book was later published as ‘Mametz Wood – Lloyd George’s Welsh Army at the Battle of the Somme’. The archive of letters received by Hughes, and all associated material, is now fully catalogued and available to search and browse on our archives catalogue ArchiveSearch. 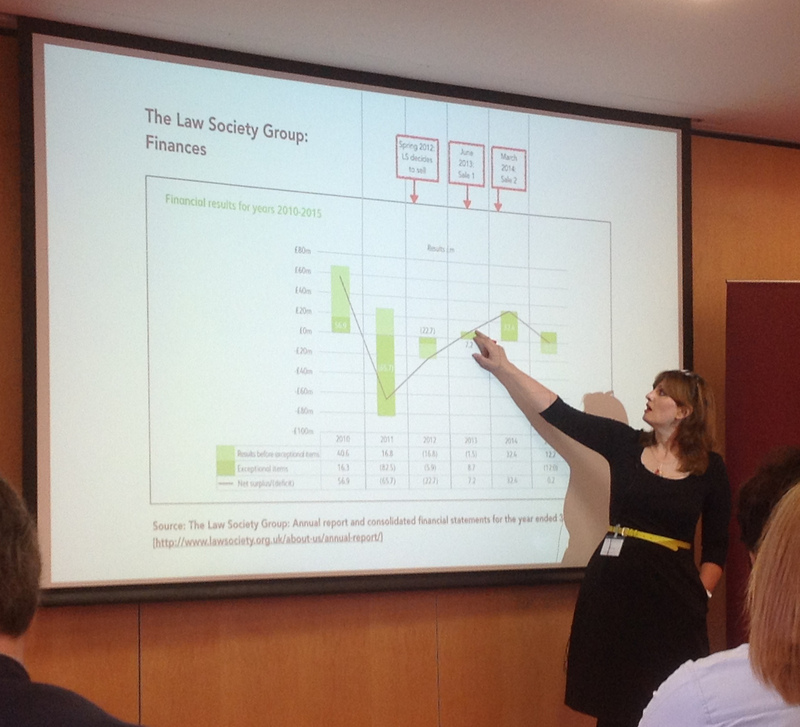 This week I travelled to sunny Caersws for the annual Archives Wales Forum. 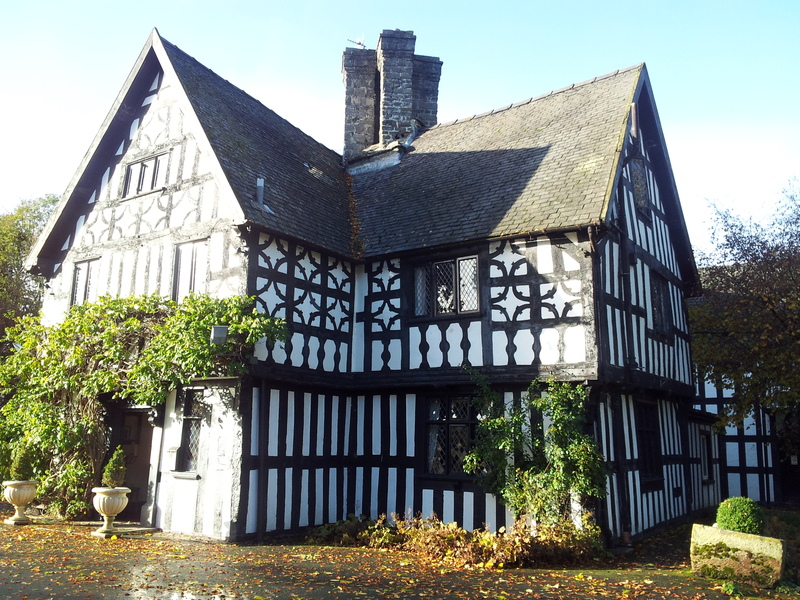 Held in a Tudor manor house, the conference was attended by archivists from across the country, from Anglesey to Gwent. The theme was ‘working together’, and over a fully packed day, we heard from twenty speakers on a wide range of topics from educational outreach to catalogue conversion. The guest speaker, Dr Aled Jones, Chief Executive and Librarian of the National Library of Wales (NLW), began the day by introducing the Library’s recently launched strategy document, Knowledge for All: Strategic Direction 2014-2017. Morning speakers included Sally McInnes on the NLW’s £20.4 million Heritage Lottery Fund bid for a national Conservation Centre, which is proposed to be built onto the area of the National Library’s building affected by April’s fire. Alwyn Roberts (NLW) reported on a project to use volunteers to transcribe shipping records, and Elspeth Jordan (National Museum of Wales) discussed their £600,000 Esmée Fairbairn funded project to conserve, digitise and carry out research on a sample from their photography collection. Both Kerry Robinson from Powys Archives and Steven Davies from Flintshire Record Office spoke about using affordable portable scanners to digitise collections and catalogues. I gave a presentation on SCOLAR’s support for a new undergraduate module in the School of English – Project Management and Research – in which students undertake workplace-based projects in exchange for course credit, in order to develop employability skills prior to graduation. The afternoon sessions focused on a number of educational outreach projects undertaken by Gwent, West Glamorgan, Anglesey and Glamorgan Archives, involving children as young as 3. All are successfully working with teachers to link local collections in with National Curriculum themes. Sarah Winning from Denbighshire archives spoke about their WordPress blog, launched to save staff time in writing annual reports and newsletters and to help reach a new online audience. 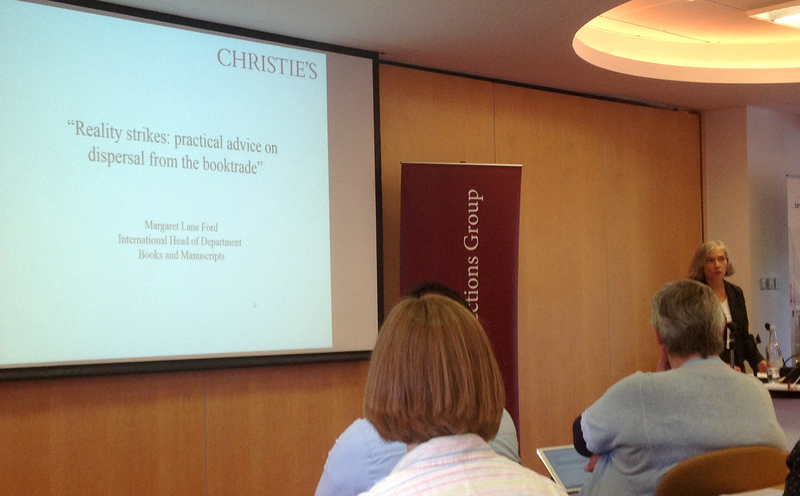 One of the most impressive presentations of the day came from Andrew Dulley of West Glamorgan Archives Service. Andrew produced an award-winning short film of the Olympic torch relay route, as it would have looked in 1908 Swansea. The resulting film is slick, professional, and successfully brings history to life – but it cost nothing to produce. Andrew used free software to carry out all transitions, image editing and sound editing, and obtained free music and sound effects under a Creative Commons licence. It is a superb example of what archives across Wales are managing to achieve despite financially straitened times, with a bit of hard work, ingenuity and imagination! ‘As I approached the end of my second year of the English Literature BA at Cardiff University, I started to think more and more about career options. I am mostly leaning towards ‘information services’ i.e. libraries and archives and thought that my own library would be a good place to start. I speculatively emailed Special Collections and Archives to explore voluntary work experience and was very excited when Alison agreed to meet me and discuss my plans. It was then agreed that I would undertake 12 weeks of work experience within Special Collections and Archives in order to gain a significant amount of experience, and to be able to really get stuck in to different tasks. 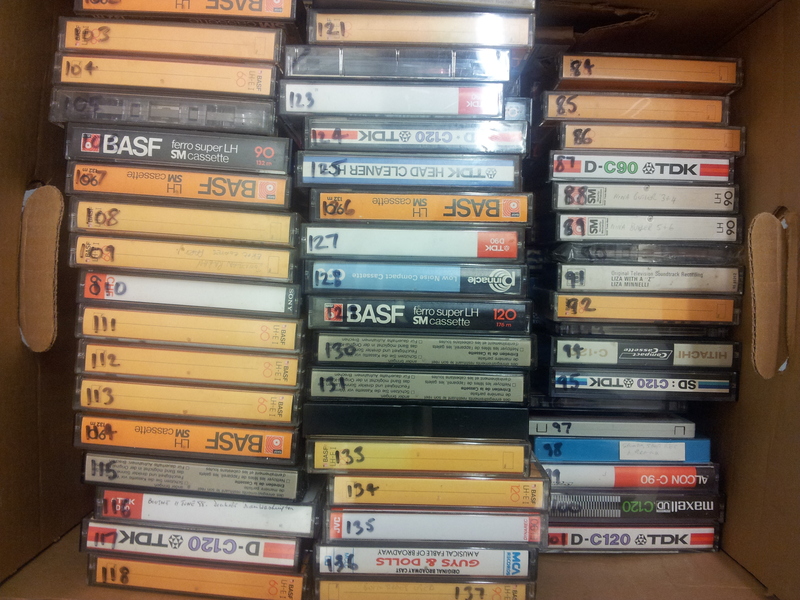 Throughout the 12 weeks I have catalogued Julian Hodge’s business archive, and completely reorganised and catalogued the archives of Keith Waterhouse, Joan Reeder and Bernard Knight. Alison provided guidance but otherwise allowed me to manage the work independently, which will act as beneficial experience for my Project Management module starting in September. I also researched and found materials for use in Special Collections seminar workshops for The Illustrated Book module, also starting this September. Through these activities, I now understand how cataloguing works, and I know how to properly use the archives, which will be hugely beneficial to my studies in my final year.